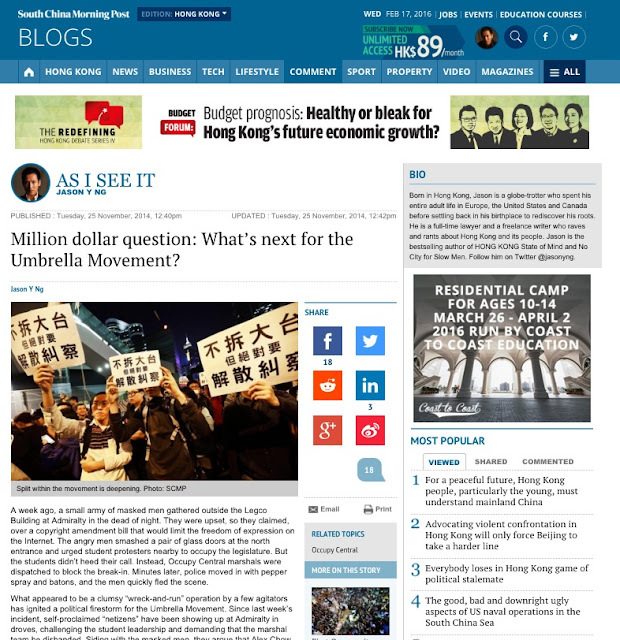 Million Dollar Question: What’s Next for the Umbrella Movement? 有獎競猜: 雨傘運動何去何從? 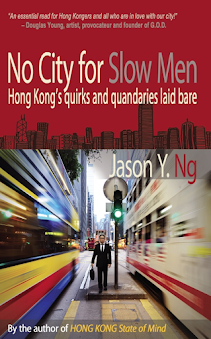 A week ago, a small army of masked men gathered outside the Legco Building in Admiralty in the dead of night. They were upset over a copyright amendment bill that they feared would limit the freedom of expression on the Internet. 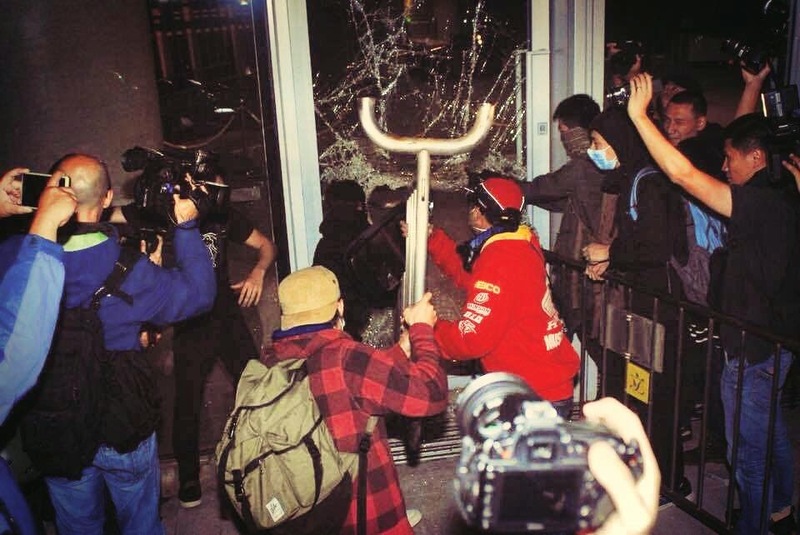 The angry men smashed a pair of glass doors at the building's north entrance and urged other protesters nearby to occupy the legislature. Not sure whether to take orders from these strangers, the students didn’t heed their call. Instead, they notified the site marshals to block the break-in. Minutes later, police moved in with pepper spray and batons, and the agitators fled the scene. Troublemakers or do they have a point? The clumsy “wreck-and-run” operation has touched off a political firestorm for the Umbrella Movement. 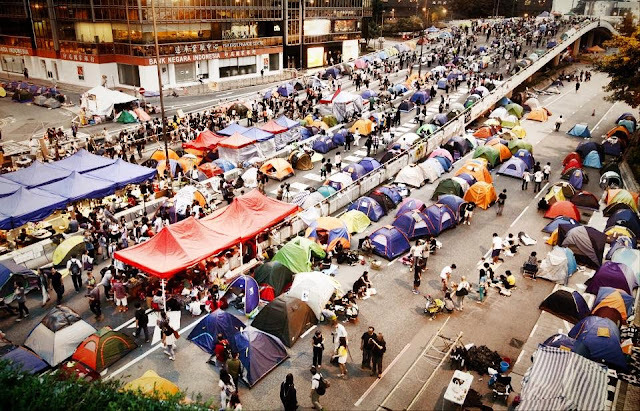 Since the incident, self-proclaimed “netizens” began showing up in Admiralty every night to settle the scores for what happened that night. 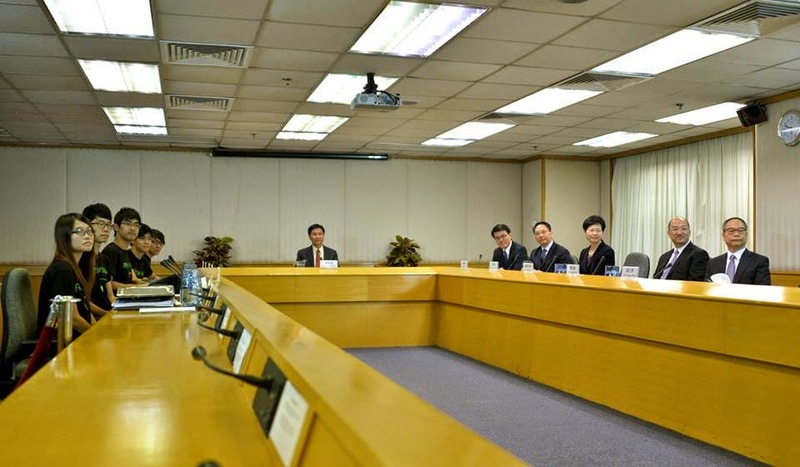 The challengers question the Hong Kong Federation of Students' (HKFS) ability to lead and the marshals' legitimacy to thwart their operations. They argue that Alex Chow (周永康) and his college buddies have grown far too comfortable sleeping in their tents and are now standing in the way of the fight for democracy. 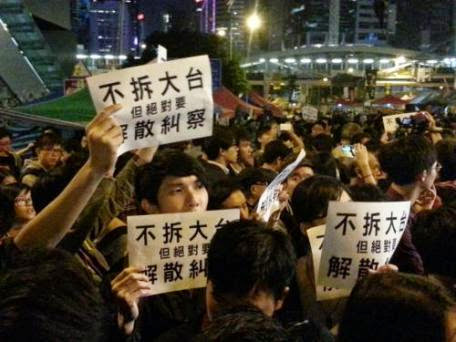 Not since the Lung Wo Road police clash a month ago have tensions in Admiralty been this high. We don't know who the masked men and their supporters are — whether they are concerned citizens or members of nativist group Civic Passion (熱血公民) wanting their 15 minutes of fame. What we do know, however, is that there is now a protest within the protest, and a revolution within the revolution. The emergence of a splinter group has laid bare a critical question facing the HKFS: should they raise the stakes instead of indefinitely prolonging the street occupation? Indeed, the Umbrella Movement seems to have hit a plateau — or stuck in a rut, depending on your views. Protesters have been camping out on the city’s arteries for nearly two months. Even though stories of students doing homework at makeshift libraries and volunteers recycling water bottles into handicrafts were commendable, critics feel that the campaign is veering off track. At some point, denizens of Umbrellaville need to wake up to the reality that occupying city streets is a means rather than an end, and that their ultimate goal is universal suffrage and not some eco-friendly utopian lifestyle. As much as some of us would like the movement to go on forever, it has to end someday, somehow. No one understands that better than the student leaders. A recent poll conducted by the University of Hong Kong found that 83% of citizens wanted the students to go home. What’s more, 68% would like the government to clear the sites if they don’t do so voluntarily. The rapid shift in public opinion now leaves the leadership with three options: (A) vacate, (B) negotiate, or (C) escalate. I take no issues with option A. 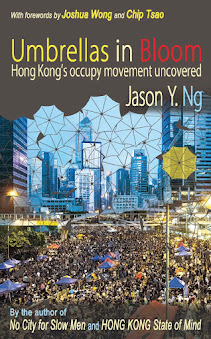 In the past, I have argued that the success of Occupy Central as a post-modern political movement is measured not only by tangible results but also by the social awakening it brings about. On that account, the students have already achieved a great deal by arousing young people's interest in local politics. Packing it in at this point should not be viewed as a failure, but a chance to regroup and re-strategize. Considering how politically sensitized the city has become, Hong Kongers will be ready to re-deploy on a moment’s notice for the next chapter in our fight for democracy. These views notwithstanding, many protesters find the first option anticlimactic and even defeatist. They believe that going home now would kill both their momentum and the dwindling leverage they have over Beijing. Turning to option B, neither the government nor the student leadership has sat down since the 21 October talks, where both sides seemed more interested in addressing television viewers than each other. Whether we like it or not, the best way — and perhaps the only way — to break the political impasse is to talk constructively about the composition of the nominating committee as stipulated in Article 45 of the Basic Law. While that is a pragmatic solution, it also requires enormous political courage from the student leaders. Conceding to a committee-based nomination mechanic would be considered by some protesters a compromise on principles. And compromise, like it is in American politics, has become a dirty word in Hong Kong these days. Between paying a political price and maintaining the status quo, the leadership has so far chosen the latter. That leaves them with option C. As is the case for many anti-government uprisings, there is nowhere to go but up. To raise the stakes, the HKFS can take a page from the classic student activism manual: picket, besiege or commandeer government buildings, just like what students in Taiwan did during the SunflowerMovement. But to pull off a major operation like that requires careful planning, skillful execution and, most of all, public support. 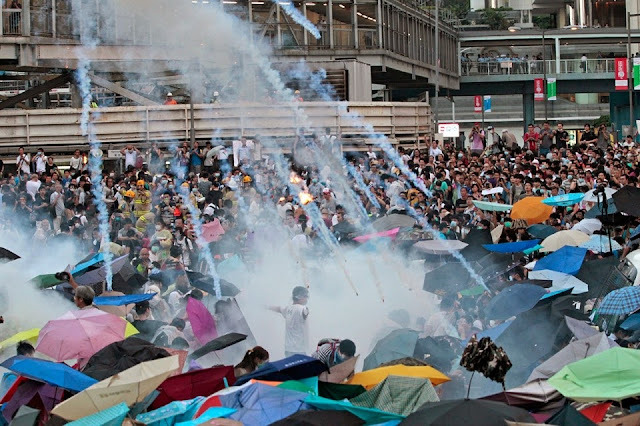 Absent a catalyst like the 28 September deployment of tear gas to galvanize the city, any attempt to up the ante would alienate the silent majority and end up like last week’s half-baked operation to storm the Legco Building – it would be doomed to fail. Many have poured their hearts into the Umbrella Movement. Two months in and with the protests now showing cracks, it is time protesters used that other muscle to figure out a way forward. There is no cash prize for answering the question of “what’s next,” but there is a high price to pay if they don’t.